Many retailers in the United States have deals on the Moto G4 Plus probably because it's trendy among Android fans. The smartphone has its price discounted almost on a weekly basis, but if you haven't yet thought about getting a Moto G4 Plus, here is a deal that might convince you otherwise. B&H now offers the 64GB Moto G4 Plus for just $180, which means you'll be saving no less than $120 when you buy the phone. 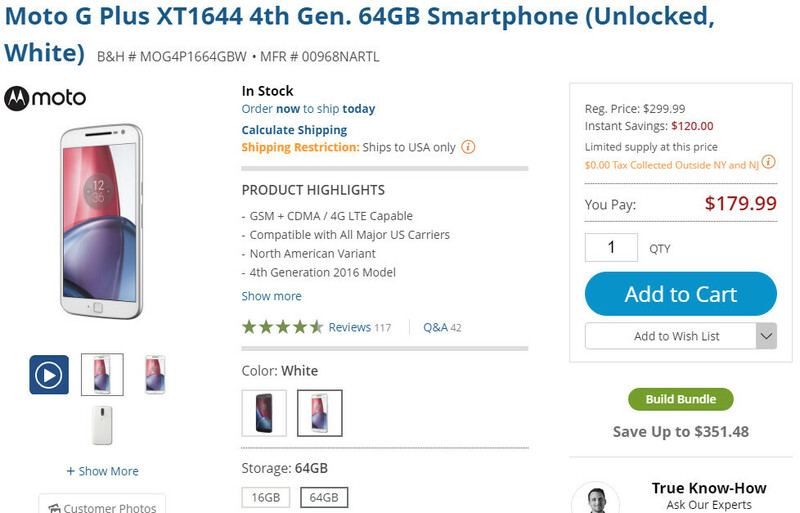 In fact, the smartphone is cheaper than the 16GB model that costs $200 right now since it's not part of any promotional offers. On top of that, the Moto G4 Plus comes unlocked and can be used on both GSM and CDMA networks, so no matter your favorite U.S. carrier, the phone will fully support it. Keep in mind though that activation may not be supported on all compatible CDMA networks, so you might want to check with your carrier before purchasing the phone. It's also worth noting that you'll be able to choose between the black and white versions of the phone. Also, B&H states there's limited supply at this price, so decide on whether to take the deal as quickly as you can. They'd have to go lower that that before I'd even consider the G4, with all its flaws and congenital issues. Like, double digit low.